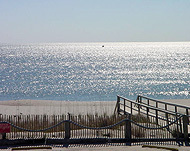 Situated at the southern tip of Pleasure Island is the small, family-oriented community of Kure Beach. A true getaway destination, it offers scenic views of the Cape Fear River, the Atlantic Ocean, and Zeke's Island estuarine complex. Uncrowded beaches, casual restaurants and comfortable accommodations combine to make Kure Beach a favorite for many vacationers. Kure Beach offers a quiet and relaxed atmosphere with a variety of coastal activities. The 711-foot long Kure Beach Fishing Pier is a great place to cast your line and test your fishing technique. History buffs will enjoy touring the remains of Fort Fisher, the last major stronghold of the Confederacy and the largest earthen fortress of its kind in the South. The adjacent North Carolina Aquarium features a 235,000 gallon saltwater tank and a 20,000 square foot conservatory, as well as live exhibits of sharks, sea turtles, alligators, and other native marine life. There is also the Fort Fisher State Recreation Area, a state park with a 4-mile stretch of undeveloped beach and several amenities. And the nearby Fort Fisher/Southport Ferry provides breathtaking views of the Cape Fear River during its shore-to-shore journey. Annual festivals include the Pleasure Island Seafood, Blues and Jazz Festival. Accommodations range from charming motels and luxurious bed-and-breakfasts to cottages, efficiencies and condominiums. A variety of island-style eating establishments that feature fresh seafood specialties abound. A carefree and relaxing vacation is in store for those who visit Kure Beach.